First open your pomegranate and pop the arils out. That is the red seed part of the fruit. If you have trouble opening pomegranates please see my easy instructions below. 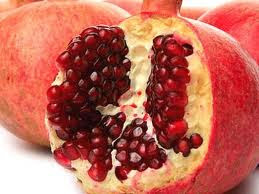 Place the pomegranate arils into a medium size bowl, add the avocado, tomatoes, and red onion. Cut the lime in half and place in the microwave for 15-20 seconds. This allows the lime to warm up a bit and be as juicy as possible. Now squeeze both halves completely over the salsa mixture and salt to taste (a little more salt than you might anticipate). Serve with tortilla chips. Easy Peasy! Start by cutting off a little less than an inch off the top and bottom. Yes this will cut into a few of the arils but it the end the sacrifice of a few, blesses the many. Then score into the skin of at least one of the sections. At this point fill up a larger bowl of water and break apart the sections of the fruit under the water. At this point the larger sections of skin will float to the top. Continue loosening the arils in the water. Take out the floating skin and membrane and drain the water to reveal a bowl of perfect arils. There you go!